This installment of the mythic monsters-series clocks in at 32 pages, 1 page front cover, 1 page inside front cover, 1 page editorial, 1 page SRD, 1 page ToC, 2 pages of introduction, 3 pages of advertisement, 1 page inside of back cover, 1 page back cover, leaving us with 18 pages of raw content, so let’s take a look! All right, so we begin this installment of Mythic Monsters with fiction – and if “Taste. Savor. Appreciate.” as a title doesn’t get you in the groove for the all too often neglected, purely evil daemons, then I sure don’t know what will – disturbing and well-crafted! The first creature herein takes no prisoners: CR 20/MR 8 Astradaemon – go! These monsters can devour souls as swift actions. Swift. Action. Oh, and that death immunity? Forget about it. They just chew that up and spit it out. OUCH. The CR 3/MR 1 Cacodaemon shows that the small bits and pieces can matter – those infected by these daemons can be telepathically contacted by the daemons…yes, this small fluff-only line is what made me grin from ear to ear here. Oh, and they can actually share their mythic power with other creatures…ouch! And yes, soul lock receives a significant flavor-increase as well. The CR 9/MR 3 Ceustodaemon (lavishly depicted in full-color) can ignore challenges, judgments, smites and sneaks and charge areas with static electricity in the aftermath of their deadly breaths – cool! The CR 15/MR 6 Derghodaemon’s insects can bypass almost everything and the rending claws and feeblemind auras of them represent well their concept of ruin and negation. The CR 10/MR 4 hydrodaemon can issue a decree of drowning to annihilate foes and negate their adaption to the aquatic environments as well as spit sleep-inducing spittle at foes…oh, and what about making water behave as the memory-draining, personality-eroding waters of Styx itself? Pure awesomesauce! At 1 CR more, the CR 11/MR 4 leukodaemon takes the concept of plague-bringer up to the n-th degree – each creature affected becomes a dread carrier and standing in the mere presence of a leukodaemon’s dread skull-face erodes your immune system…and like the legendary creatures from real world mythology, the champion’s unstoppable shot complements these creatures perfectly. The CR 14/MR 6 Meladaemon is a creature of dread hunger and as such, the consumptive aura and the locust conjuration these daemons bring to the field of battle…oh, and those unlucky enough to perish to these creatures will rise again as mythic ghasts…and then there would be the fact that a significant portion of the damage these foes cause can only be healed by eating…yeah, no quick heal ups…ouch! Oh, and have I mentioned the crippling aura that may expel contents from the digestive systems of their victims? OUCH! The CR 12/MR 5 Piscodaemon would be the poisonous adversary to the leukodaemon’s disease, healing when foes succumb to poison…nasty one. Speaking of nasty: At CR 22/MR 9 Purrodaemons, as generals of the daemonic armies, not only receive lethal synergy with other creatures of Abaddon, their very flesh disarms foes, their crits permanently lower Wis and they may transform weapons into devastating tools of destruction by sheathing them in their very own flesh…oh, and for enough mythic power, they can unsheathe all flesh-sheathed weapons and have them dance and cut their foes to shreds. The CR 16/MR 7 Thanadaemon can annihilate death protection, cause premature aging and gain feats by embedding gems into its eye-sockets…oh, and as inevitable as old age’s death itself, thanadaemons are truly hard to finally defeat and crushing extracted soul gems make wresting the dead from their greedy claws a task worthy of heroes of mythic pedigree. In the low-to-mid section, the Venedaemon as CR 6/MR 2 may not have too many abilities, but the way in which soul gems can be used by them to power mythic magic is pretty smart. The Vulnudaemon, at 1 CR less receives an upgraded aura of dread. Editing and formatting are top-notch, I noticed no significant glitches. Layout adheres to Legendary Games’ two-column full-color standard and the pdf comes fully bookmarked for your convenience. The artworks provided are nice as well. Alistair J. Riggs, Alex Riggs, Steven T. Helt and Todd Stewart provide a great array of daemons herein: The servants of true, pure undiluted evil are horribly effective at their given themes, the daemons herein feel like dread scourges of the lands, like the forces of apocalypse itself being unleashed upon the land: Basically, the daemons herein are all about inevitability: No matter how good your defenses, no matter how hard you think you are, these bastards will hit you hard and in the hands of a capable GM, their subtle, eroding powers make them worse foes to civilization than the more straight-forward demon-kind. To me, these daemons are more exciting, more frightening than the demons – and for the most part, they are expertly crafted, disturbing and unique – though the last two (Vene + Vulnudameon) could have used some additional tricks, particularly since the theme of soul destruction/consumption is a cool leitmotif that is featured among other daemons herein as well. The Vulnudaemon…falls just flat compared to every other creature herein. 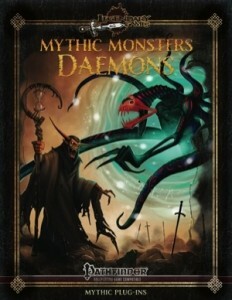 Now mind you, this is me complaining at a high level – the mythic monsters series has established an exceedingly high standard and this book certainly should be bought by anyone even remotely interested by daemons – the vast majority of the creatures herein is AWESOME. Hence, my final verdict will clock in at 5 stars, omitting my seal of approval only by a margin. You can get this cool bestiary of soul-destroying menaces here on OBS and here on d20pfsrd.com’s shop!